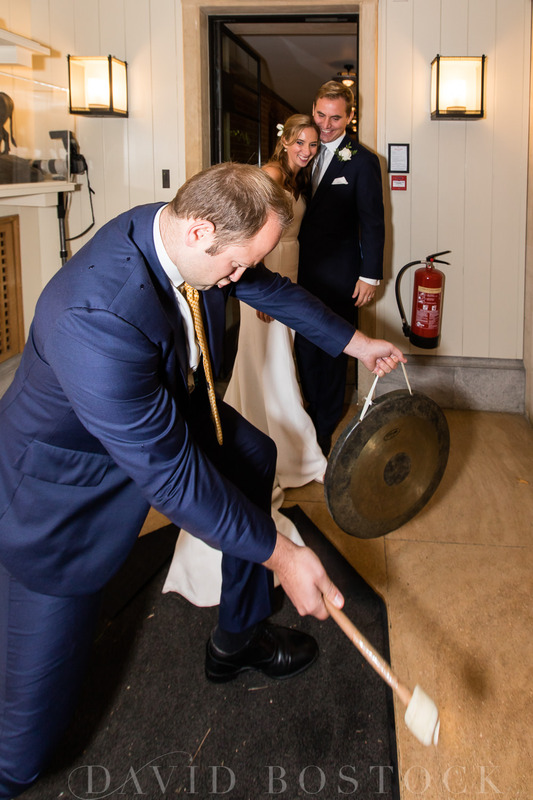 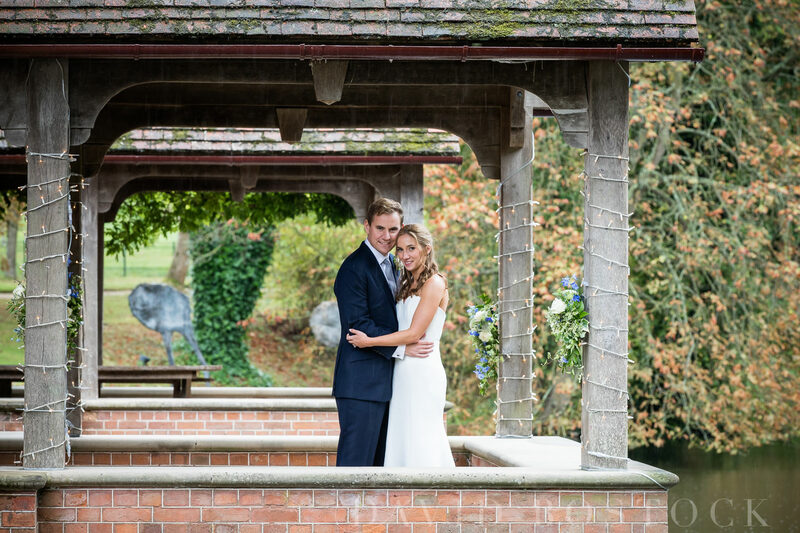 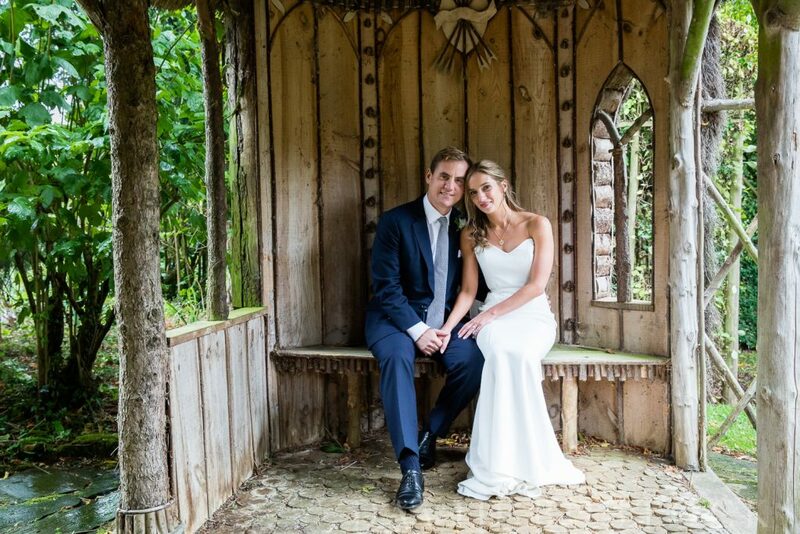 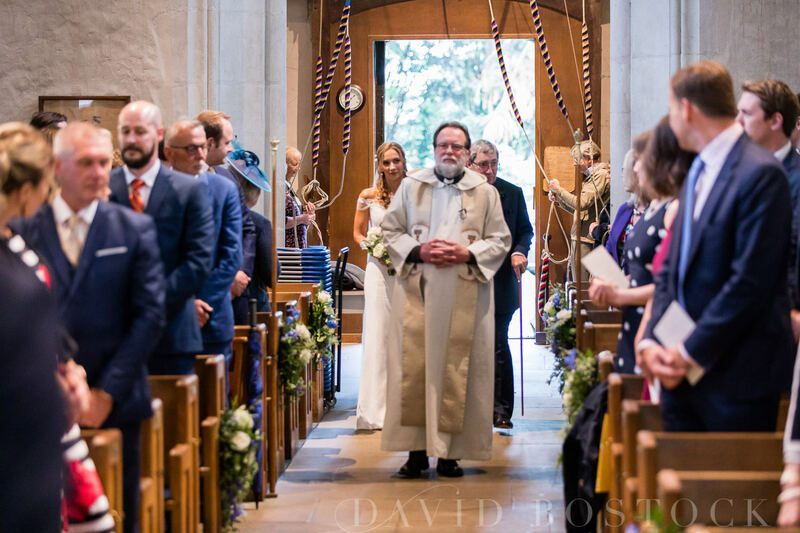 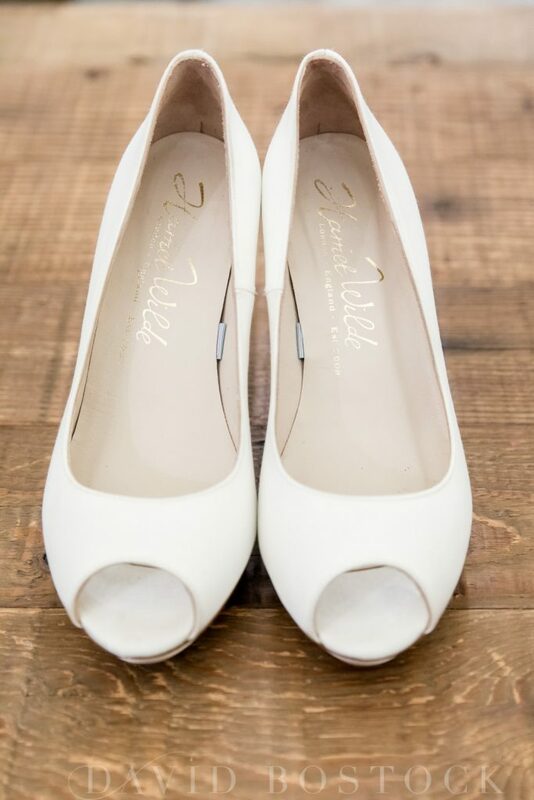 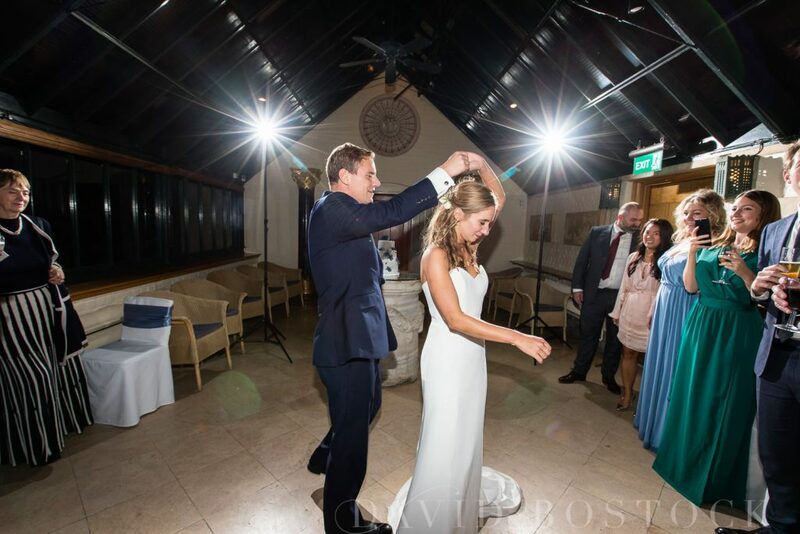 Kathryn and Thomas’ gorgeous wedding day at the beautiful countryside setting of the Dairy at Waddesdon Manor, goes to show that no amount of rain can put a dampener on a couple’s special day. 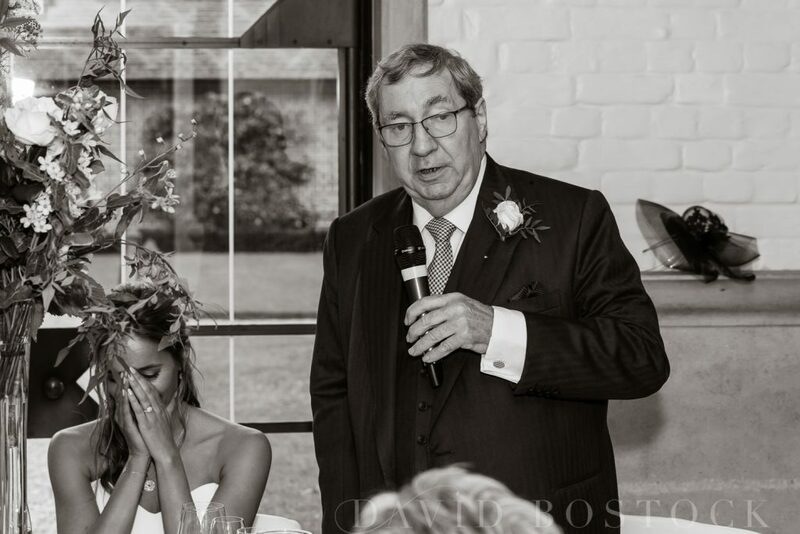 I’ve shot a lot of weddings at the Dairy at Waddesdon, in fact I’m very proud to be one of their recommended photographers, and for me, it really does have it all. 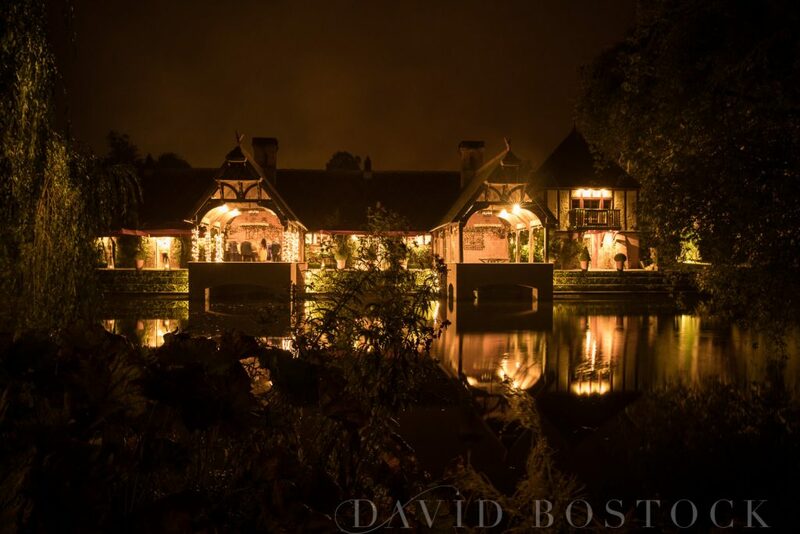 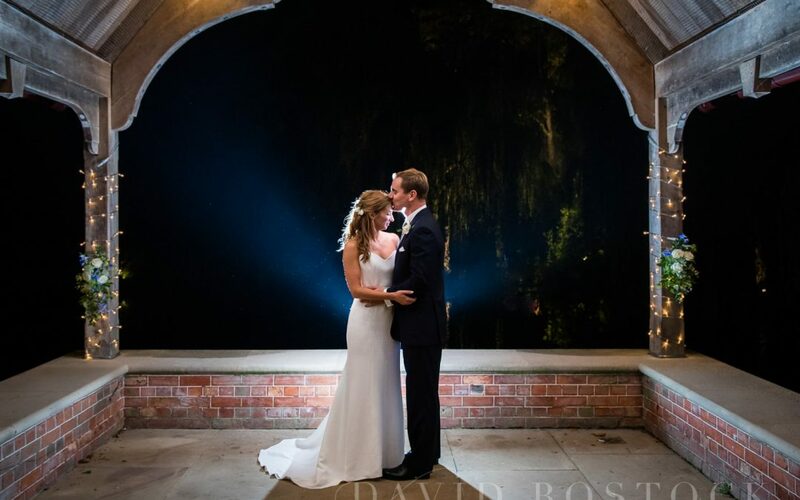 This exclusive use, lakeside wedding venue in the breath-taking Buckinghamshire countryside, is tucked away on the Waddesdon Estate, surrounded by picture-perfect gardens. 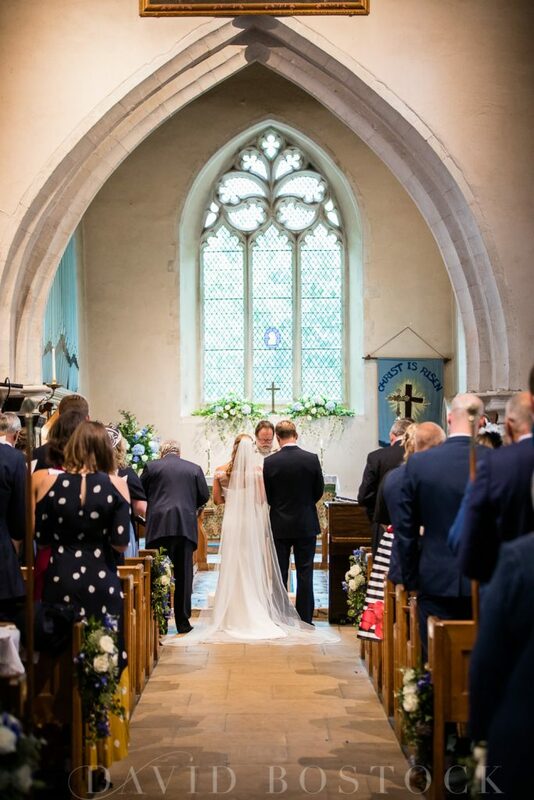 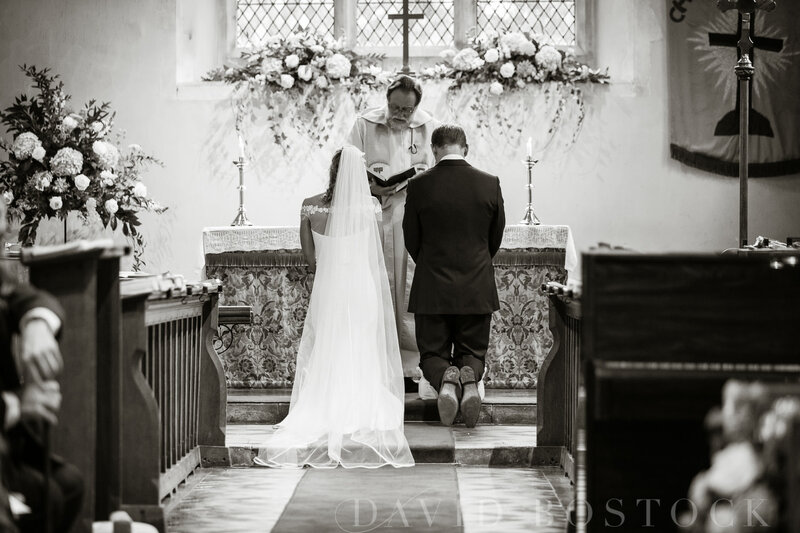 You can even opt for an outdoor ceremony, but luckily our bride and groom, Kathryn and Thomas, chose a church service at the nearby St Mary the Virgin’s Church, as the rain was pouring for most of the day. 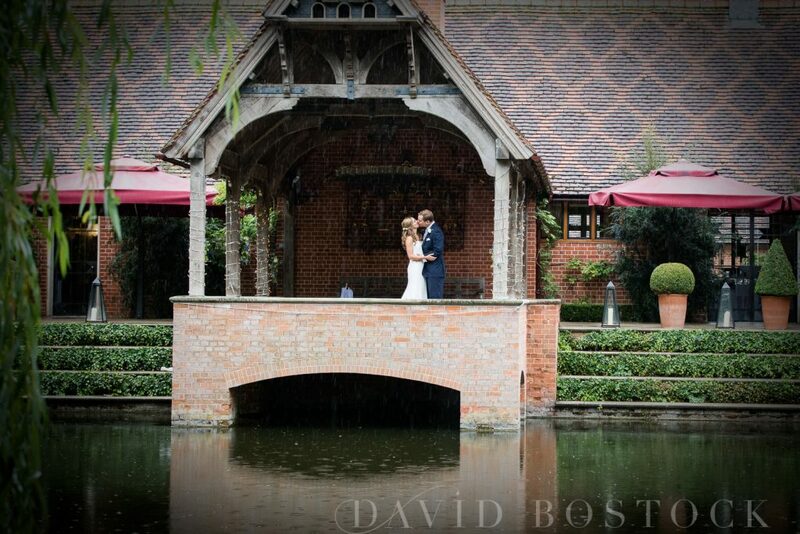 Definitely not a day for an al fresco ceremony! 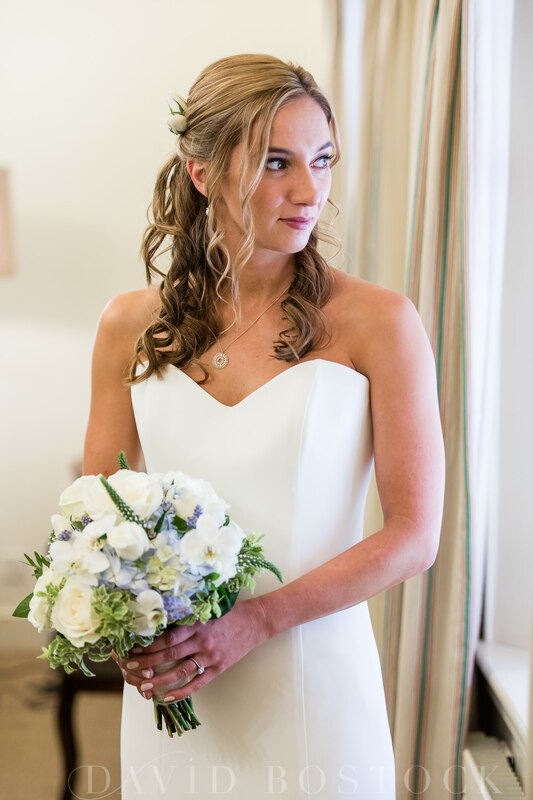 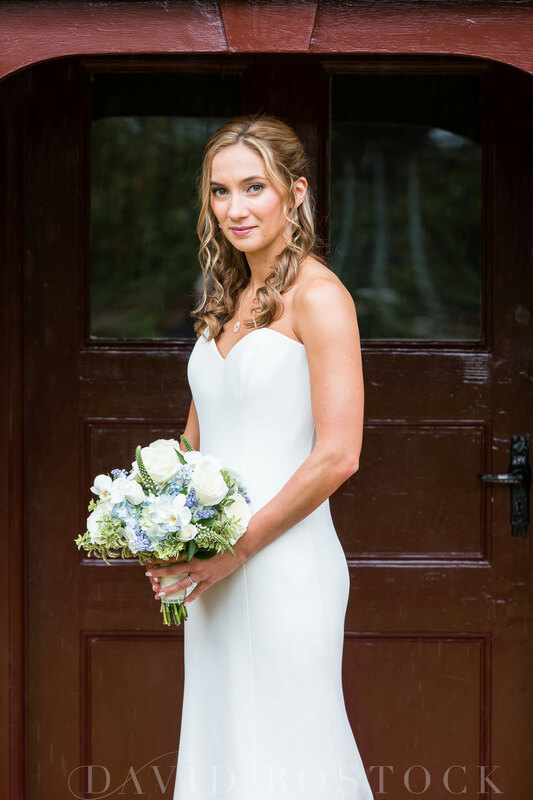 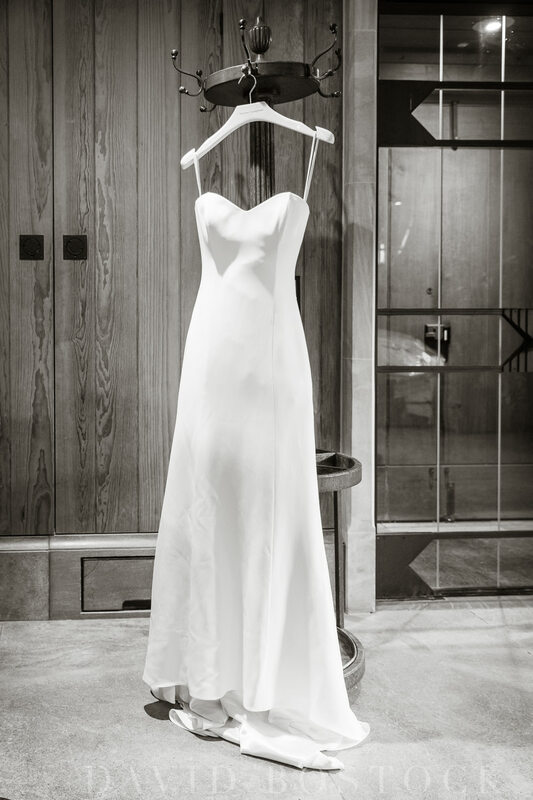 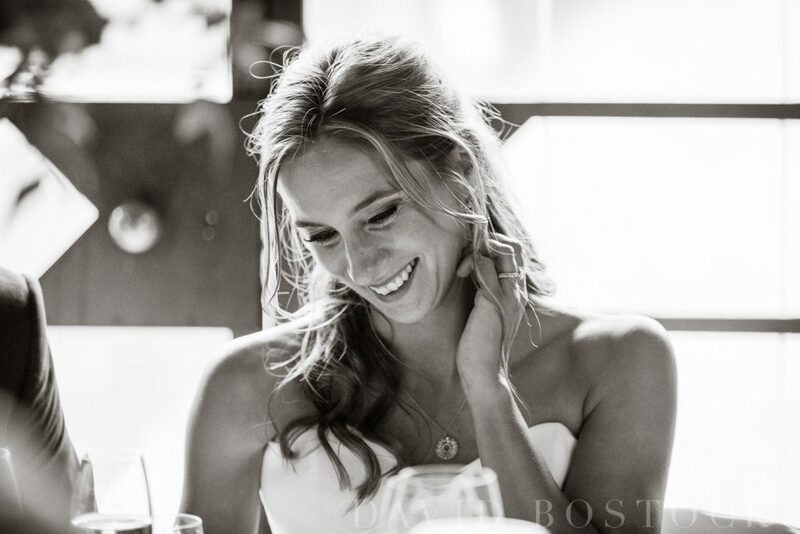 Kathryn oozed sophistication in a classic CAROLINE CASTIGLIANO dress called Kate, with a sweetheart neckline. 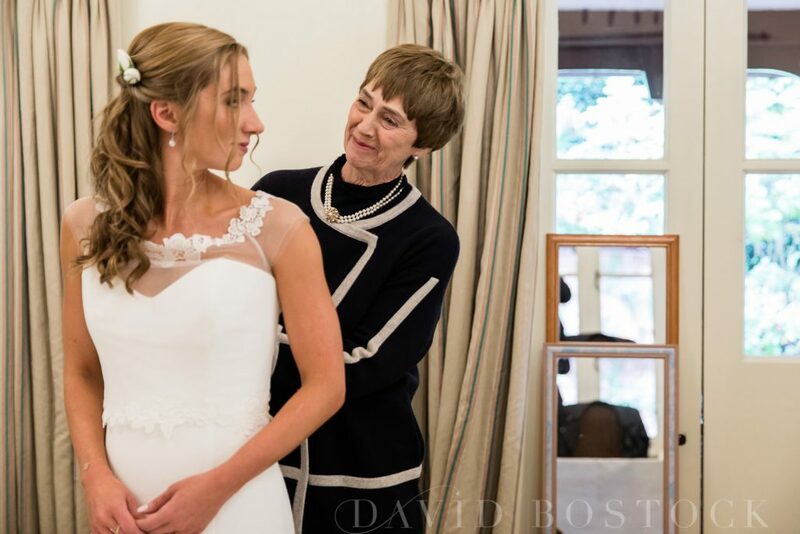 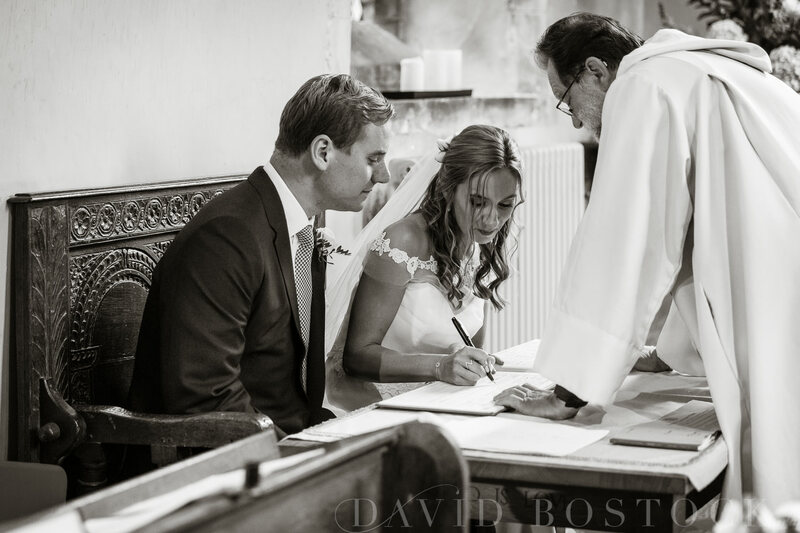 She added an elegant embroidered tulle top for the church service, as well as a dramatic veil. 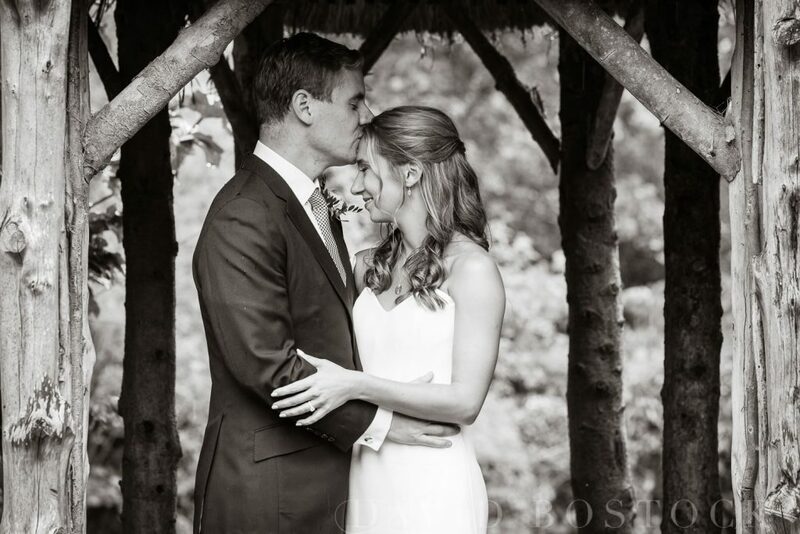 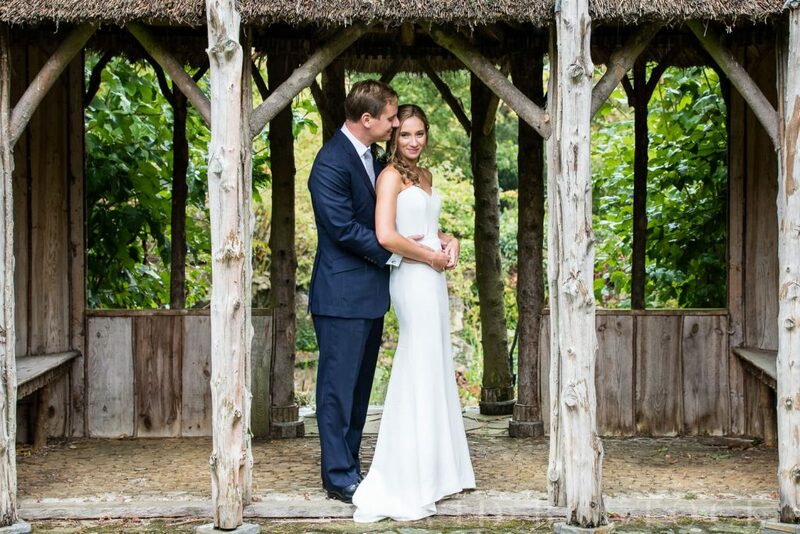 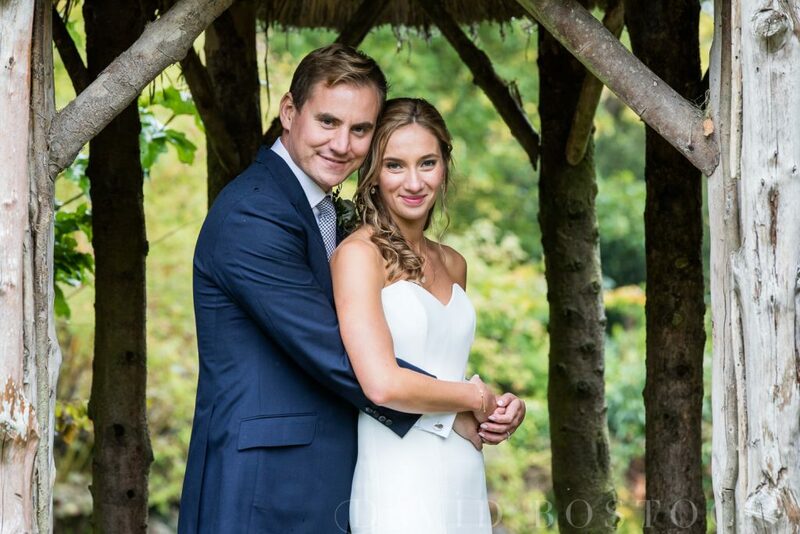 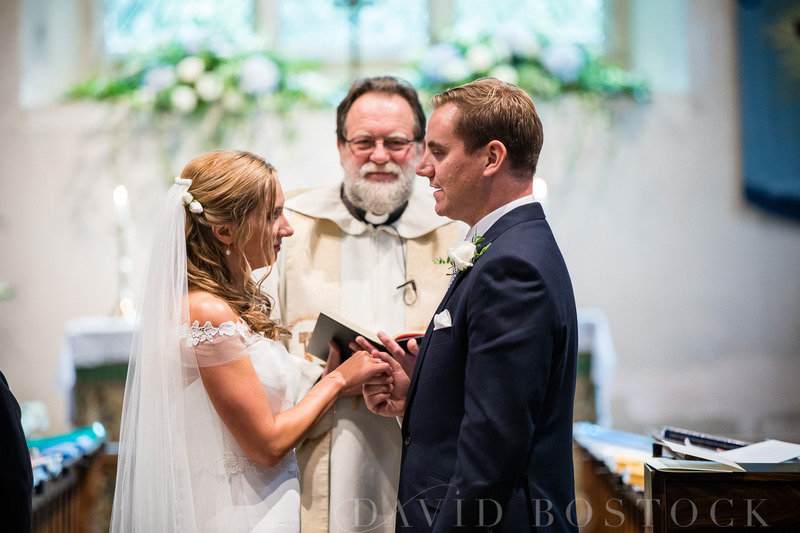 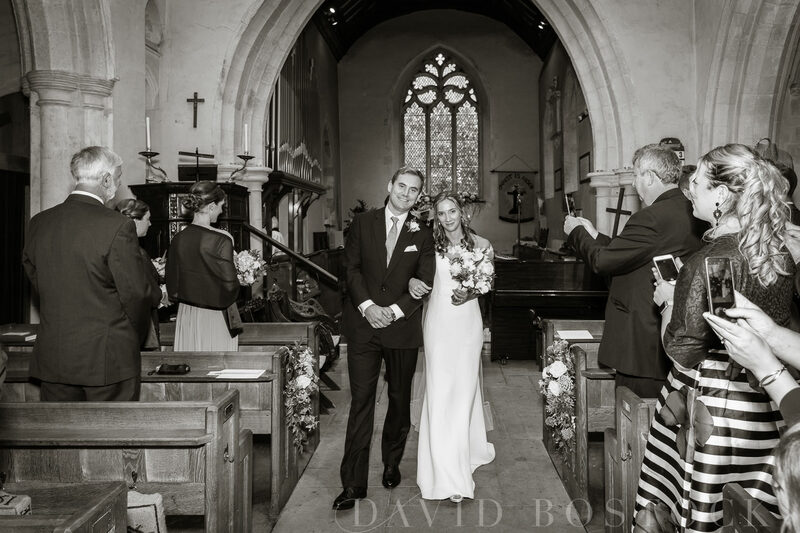 The overall look was seriously classy – Thomas was a very happy man! 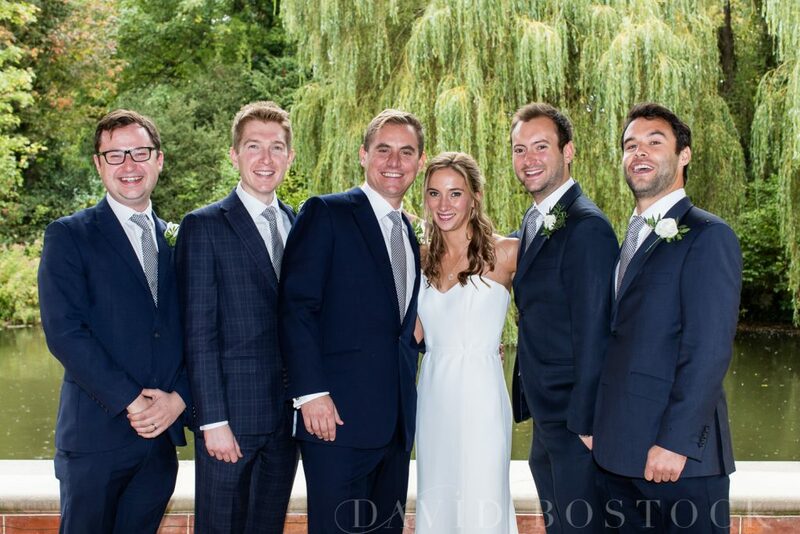 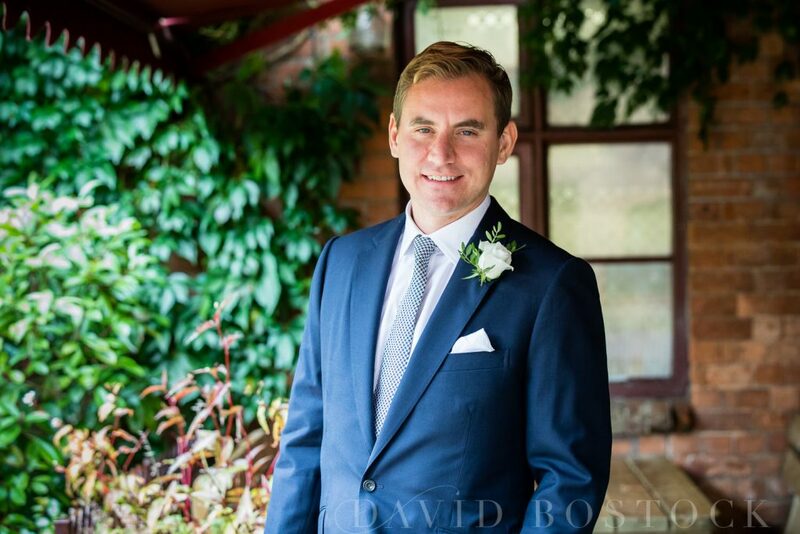 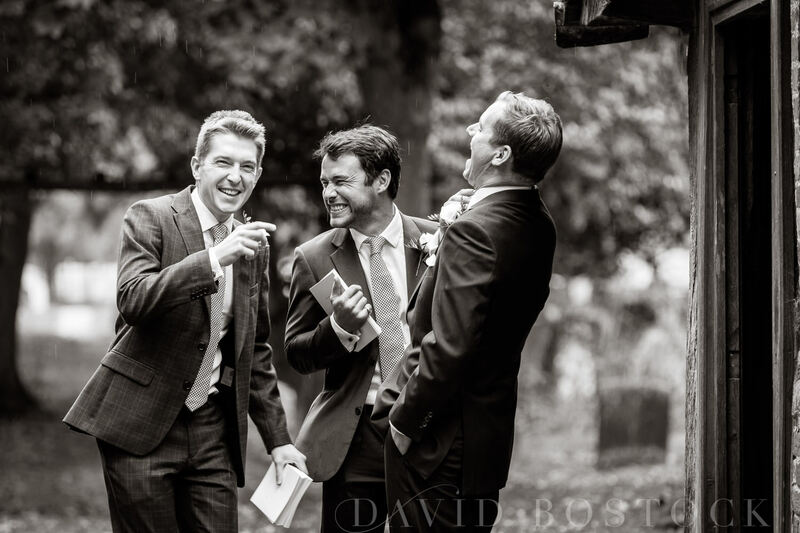 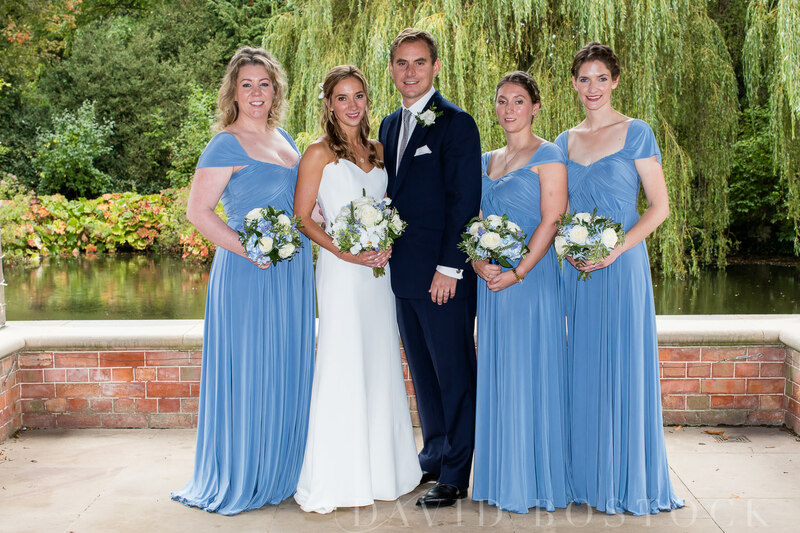 The groom wore a dark navy-blue two-piece suit with a chequered tie, while the bridesmaids looked fantastic in cornflower blue, floor-length, flowing gowns. 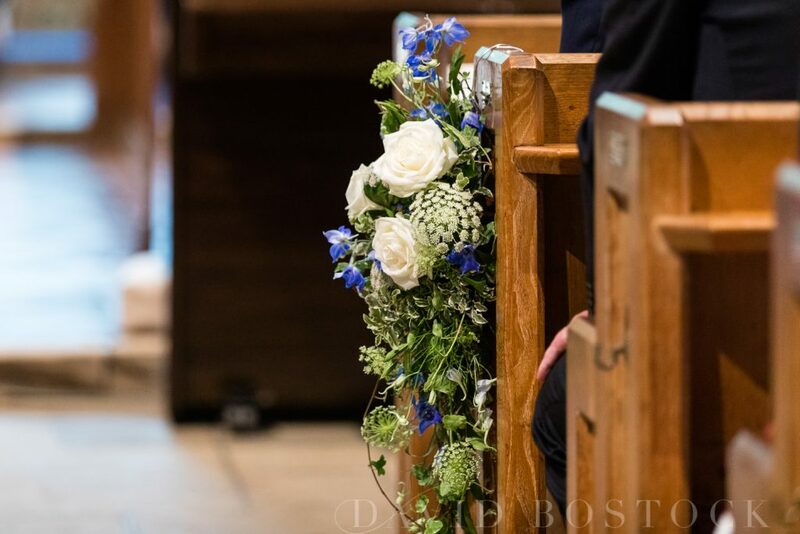 The timeless bouquets of white and blue flowers, with lots of green foliage, brought the whole wedding party look together perfectly. There’s no getting away from it – this was one rainy day! 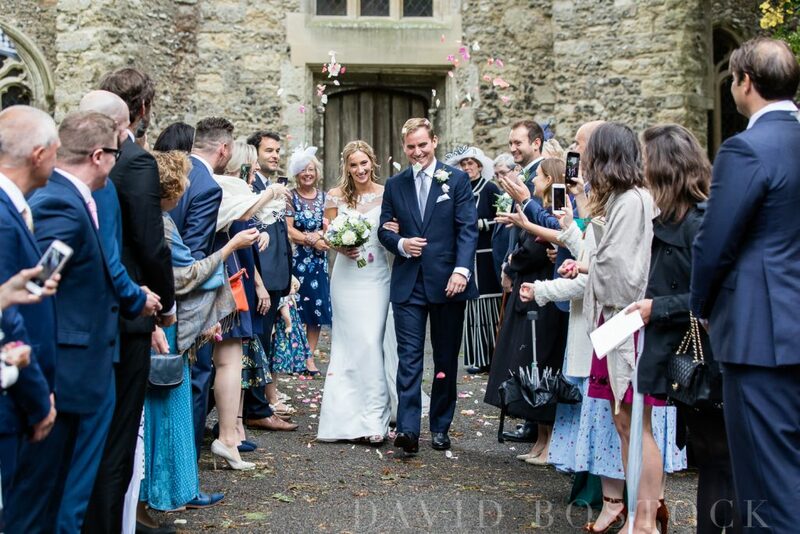 It poured literally all day, apart from a small break when Kathryn and Thomas came out of the church – just in time for the confetti shot, which was pretty lucky! 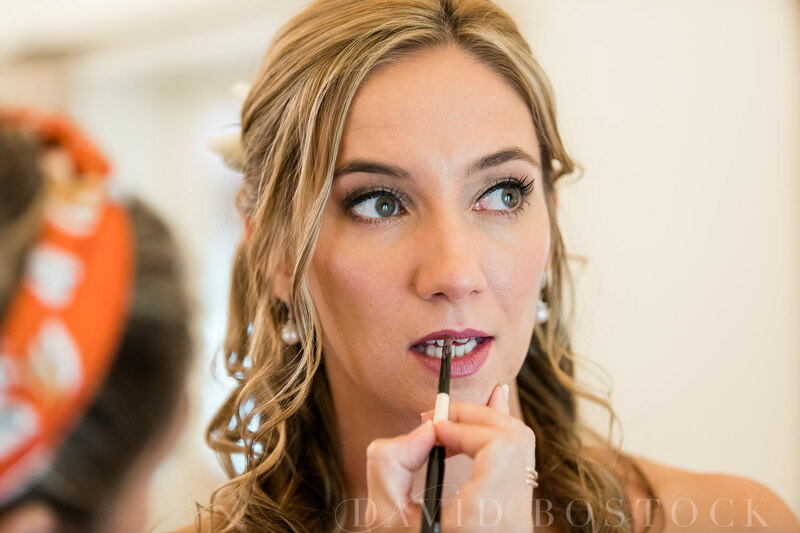 Kathryn got ready with her bridesmaids and Mum at the Dairy, and I was on hand to get some relaxed ‘getting ready’ shots. 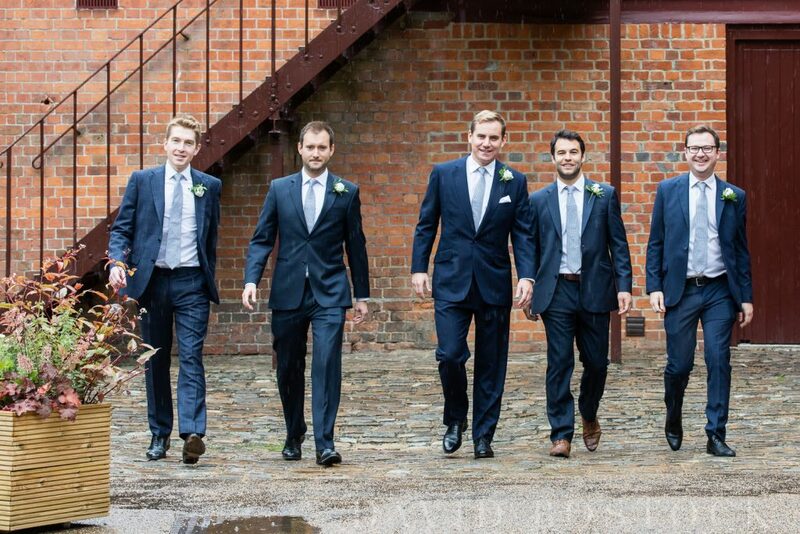 Thomas and his groomsmen started the morning at The Five Arrows hotel close by. 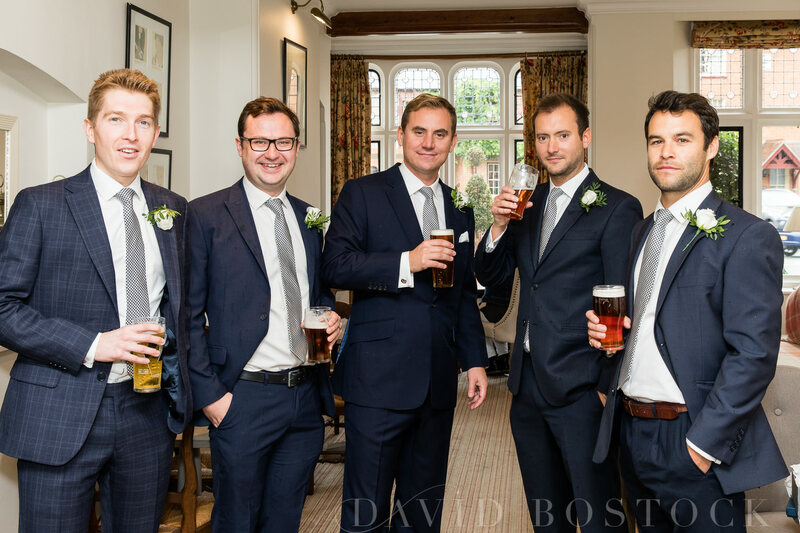 They enjoyed a drink or two to calm the nerves and I even managed to get some shots of then outside when the rain briefly slowed down. 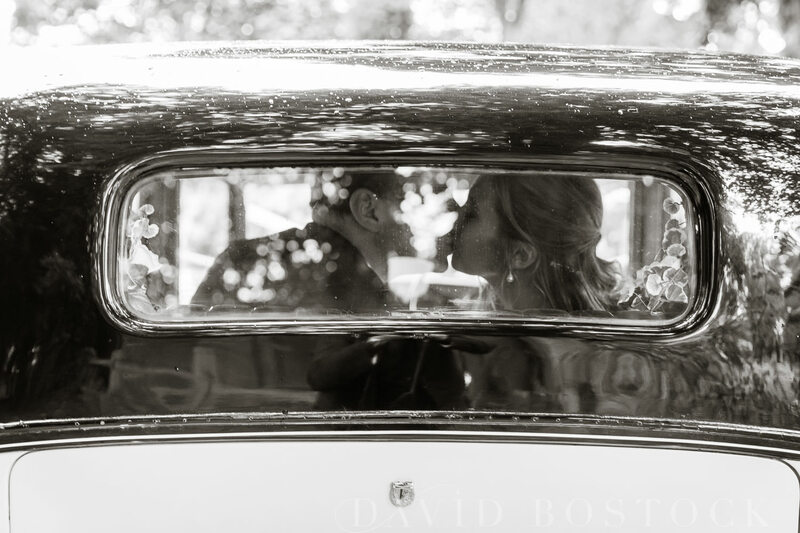 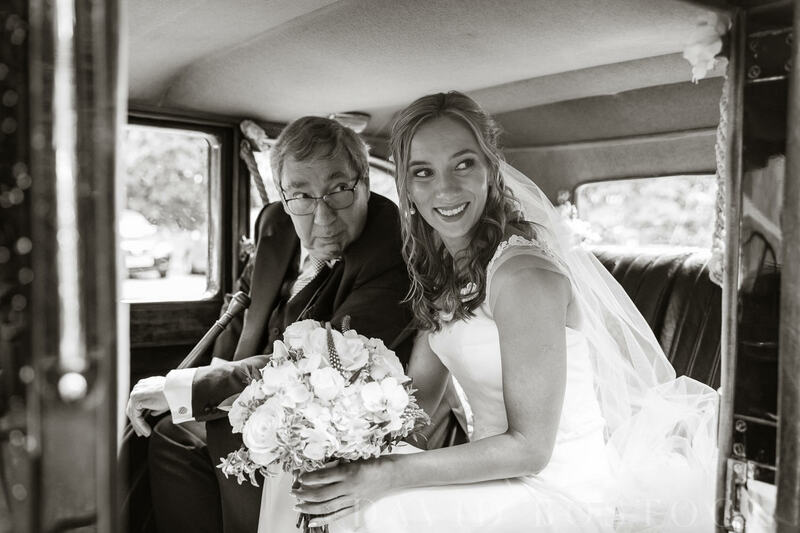 Despite the rain, the bride arrived in style – chauffeured to the door in a beautiful Rolls Royce that used to belong to Winston Churchill, hired from Alan Dyson Vintage Hire. 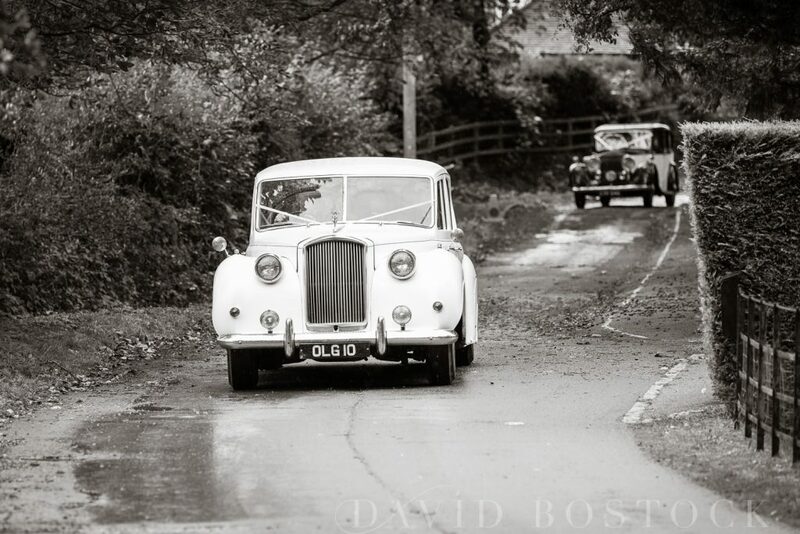 What a car! 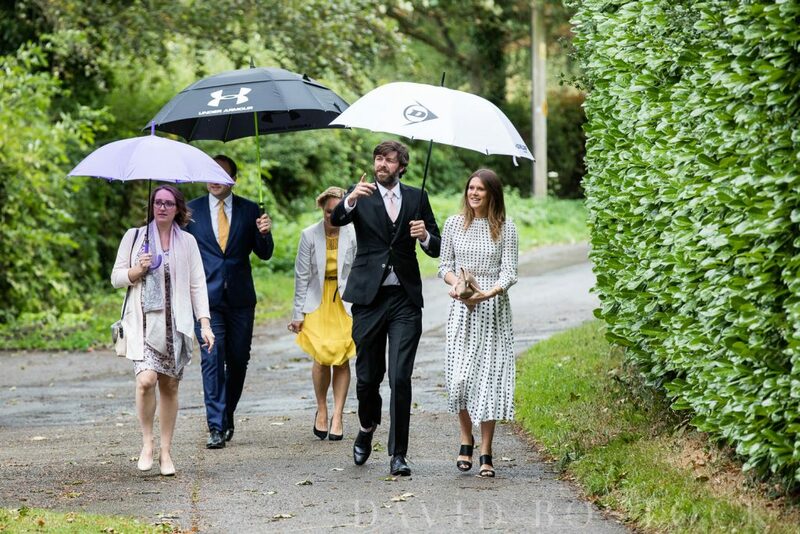 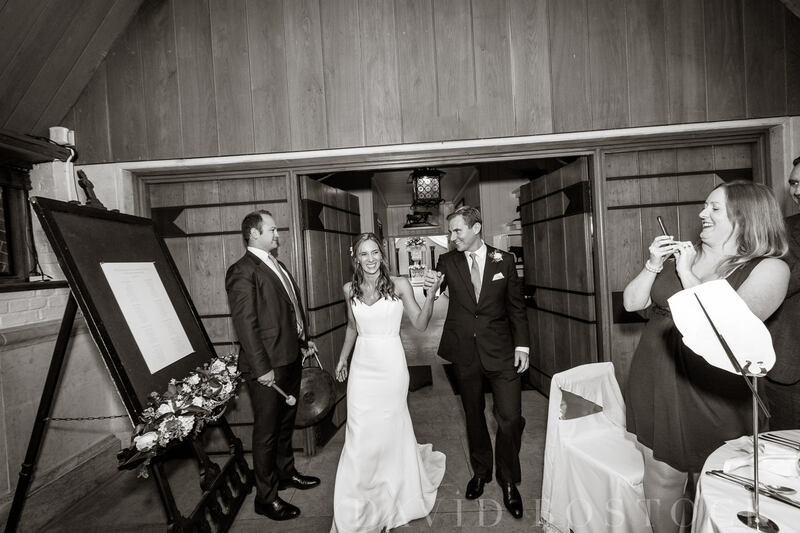 After the ceremony, the happy couple were whisked to the Dairy at Waddesdon for the celebrations to continue. 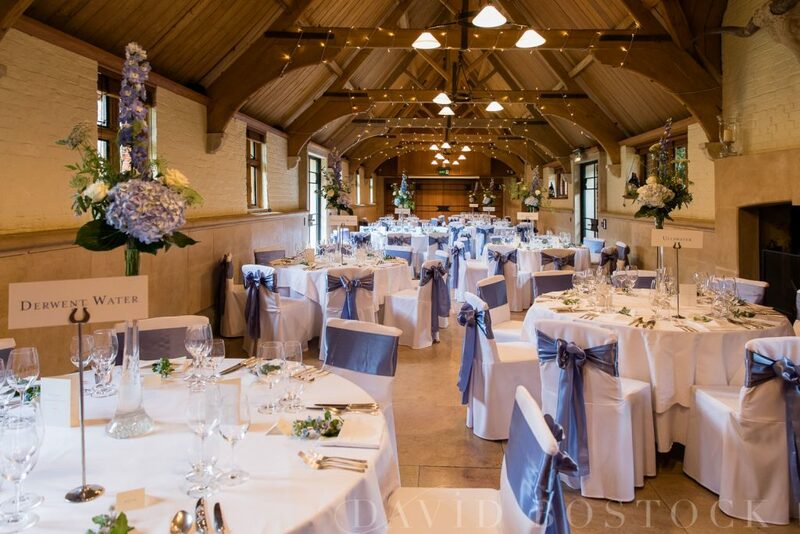 The reception room looked stunning, all dressed for the wedding breakfast. 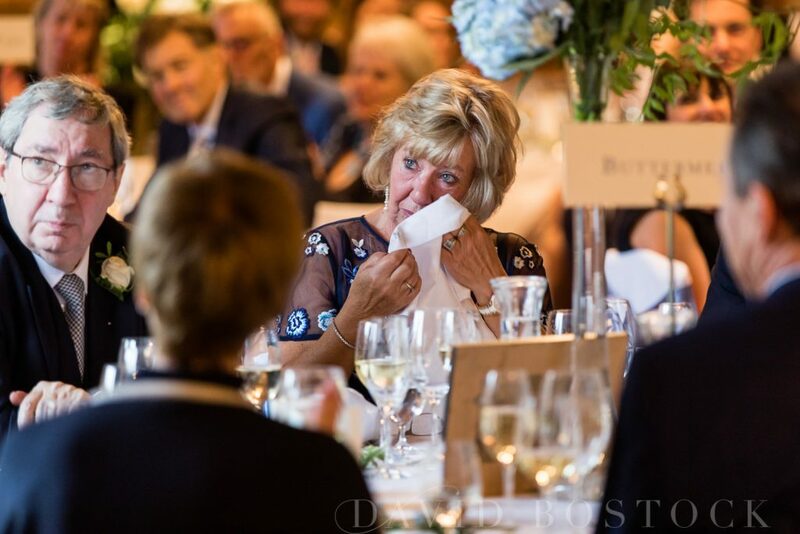 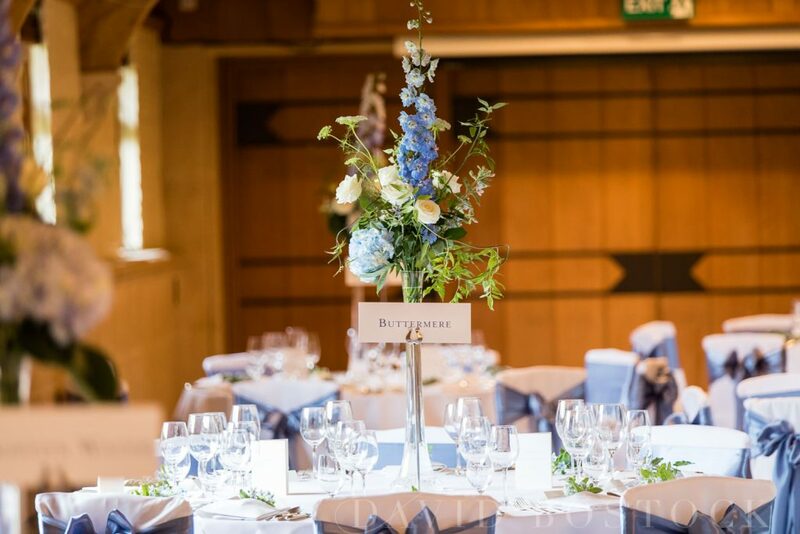 Kathryn and Thomas chose famous lakes from the Lake District as their table names, and the soft blue colour scheme was carried through with tall floral table arrangements and ribbons around the chairs. 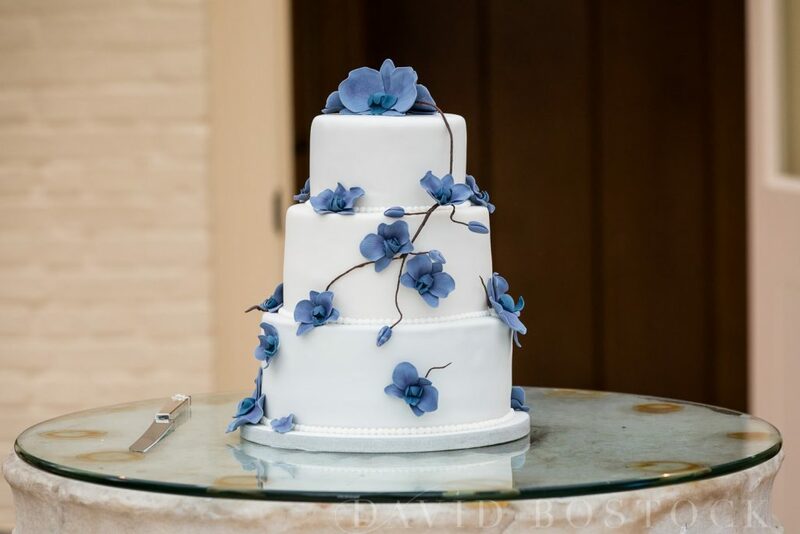 Even the wedding cake matched the theme perfectly. 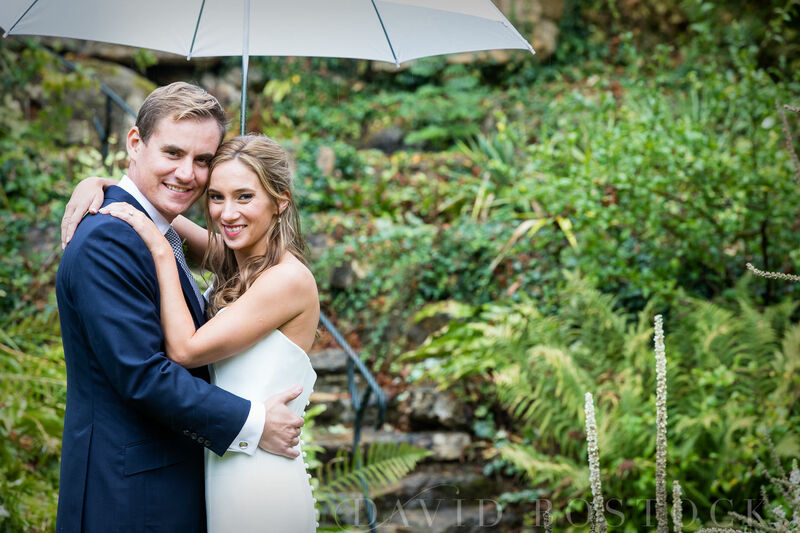 Typically, the rain didn’t let up for the couple shots, but armed with white brollies, Kathryn and Thomas were good sports and really up for it all, despite the weather! 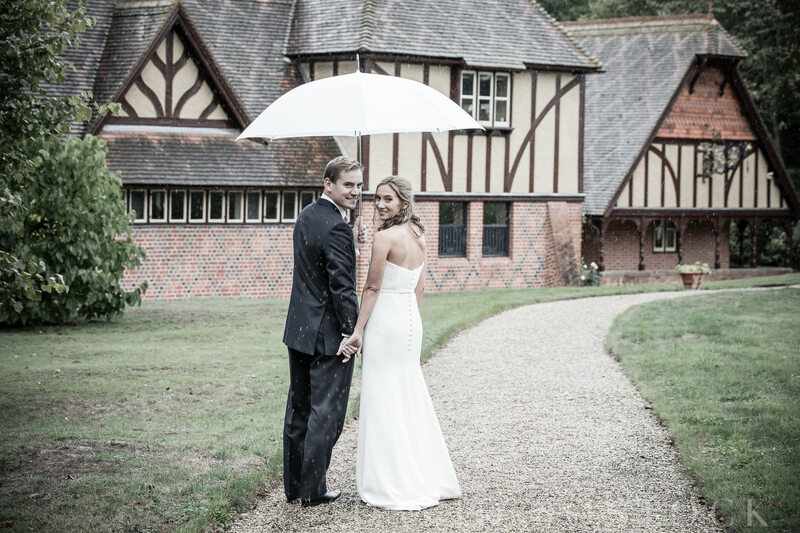 There are some great outdoor locations for gorgeous photos around the Dairy at Waddesdon, and there was no way the rain was going to stop us from taking advantage of the stunning scenery. 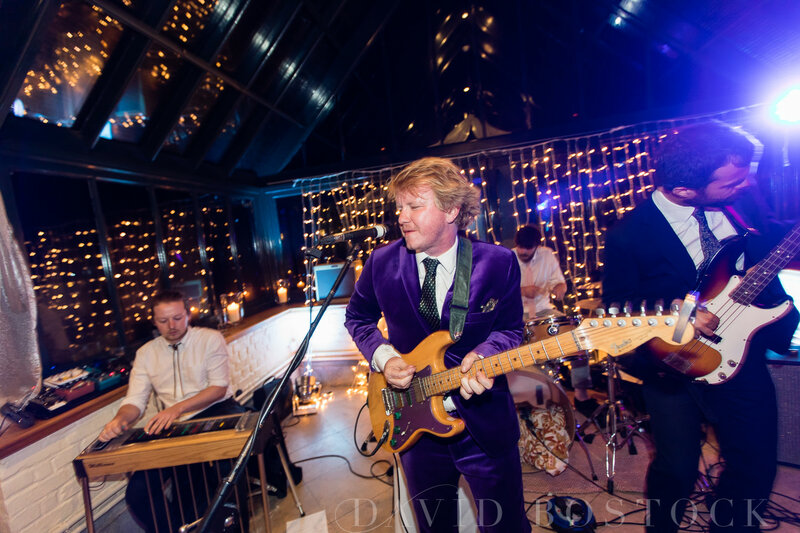 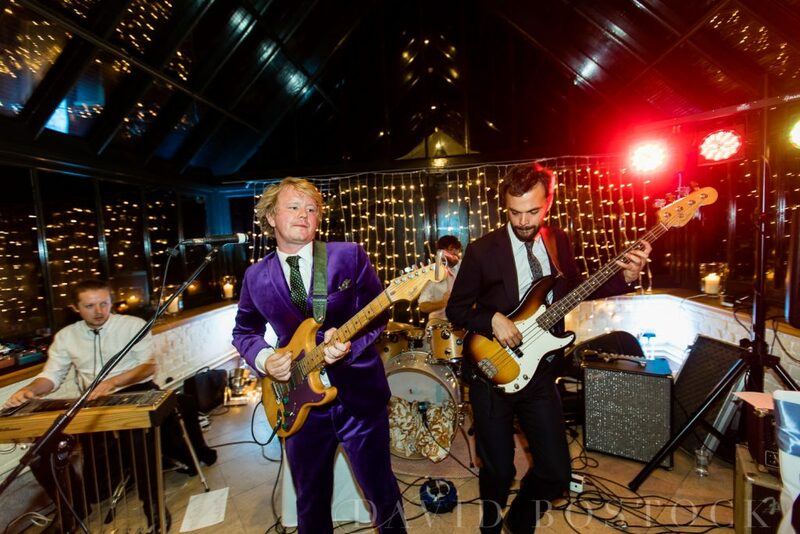 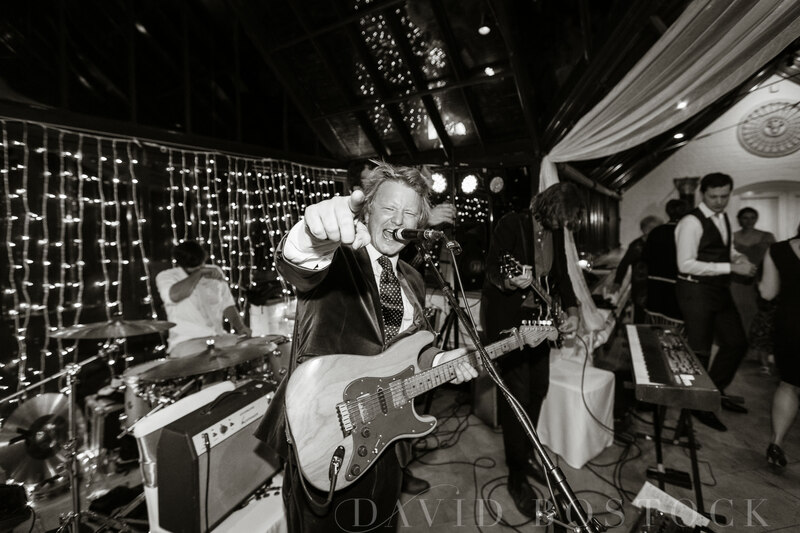 As the day turned into evening, the party really started, thanks to an awesome band with a very energetic lead singer, resplendent in his cool purple velvet suit – I love the photos of him really getting into their set! 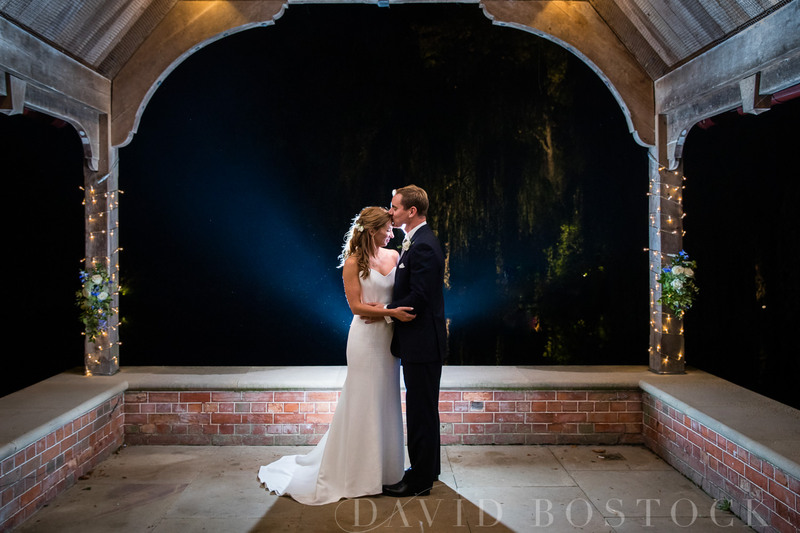 I managed to steal Kathryn and Thomas away for a stunning shot of them back lit against the dark night. 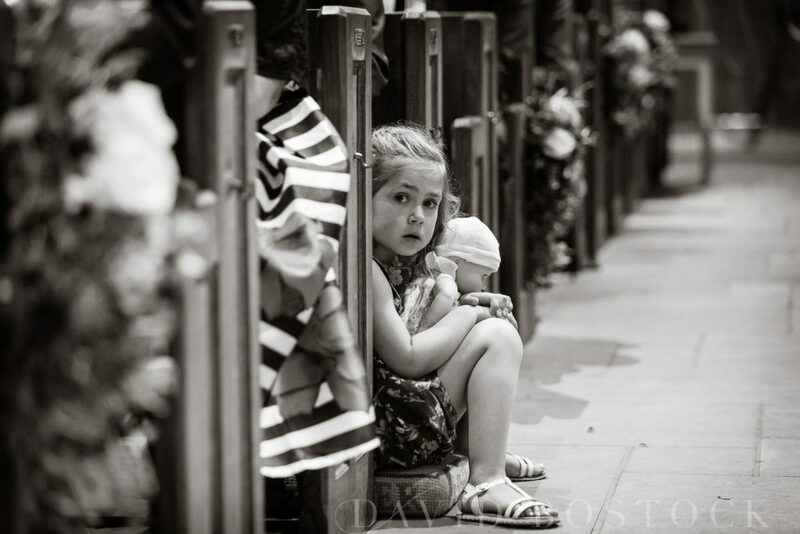 It won a Highly Commended in the MPA High Achievers awards, which I was very chuffed about. 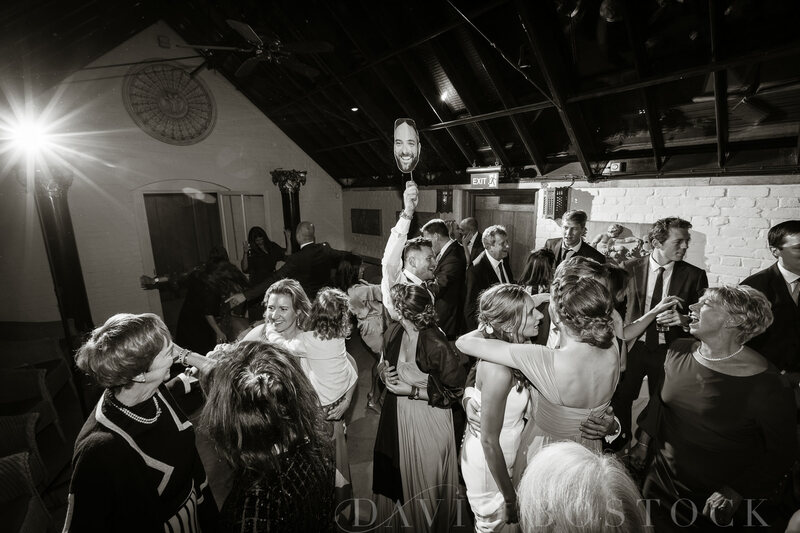 After that, I left the bride and groom and their guests to it, but it sounds like that was when the party really started. 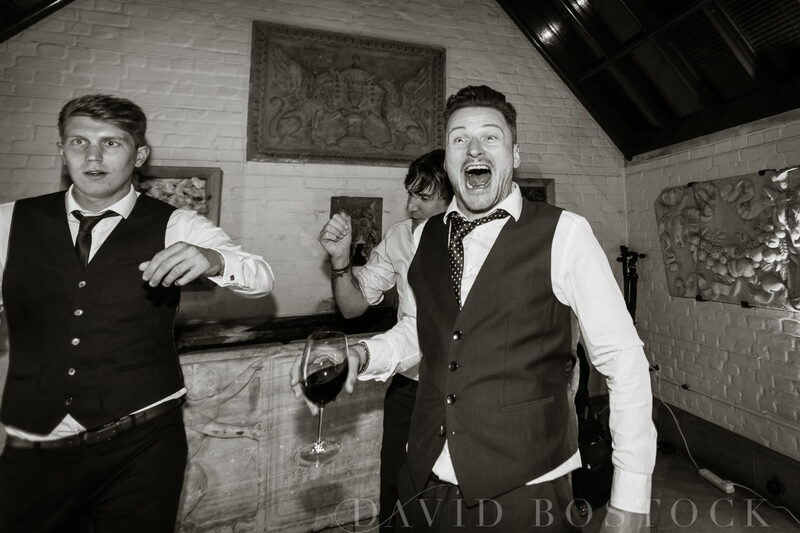 When I met up with Kathryn and Thomas to sort their wedding album, they revealed that things may have got a bit wild at the end of the evening, with rumours of a couple of guests swimming in the lake and security being involved – obviously here at David Bostock Photography we cannot confirm or deny this… sounds fun though! 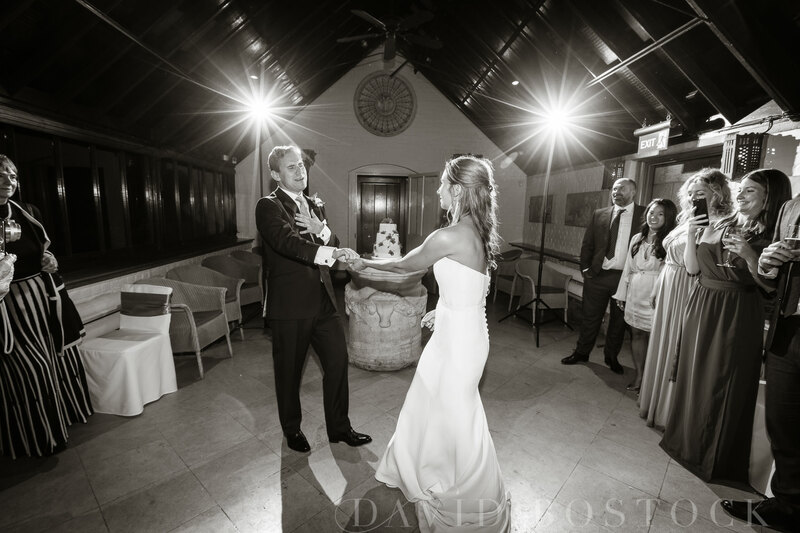 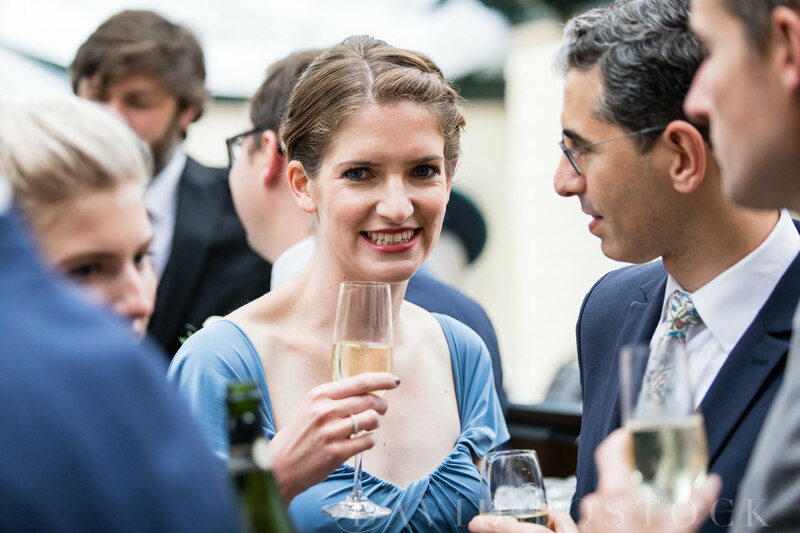 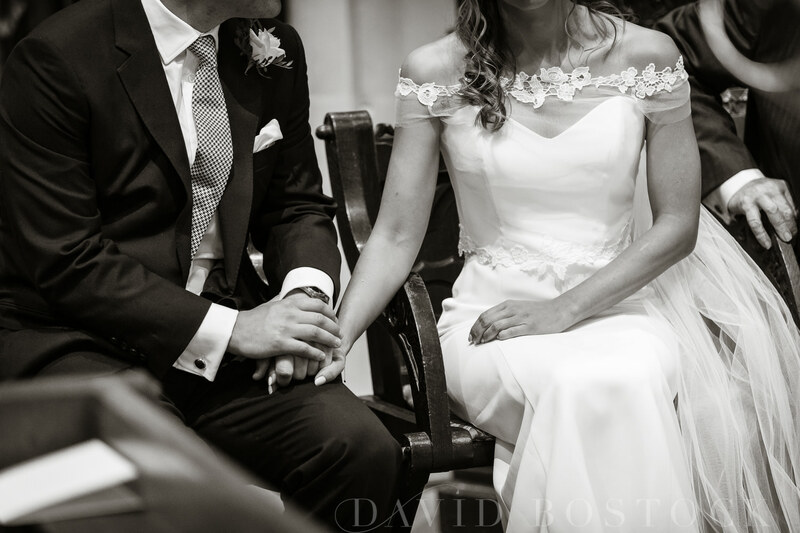 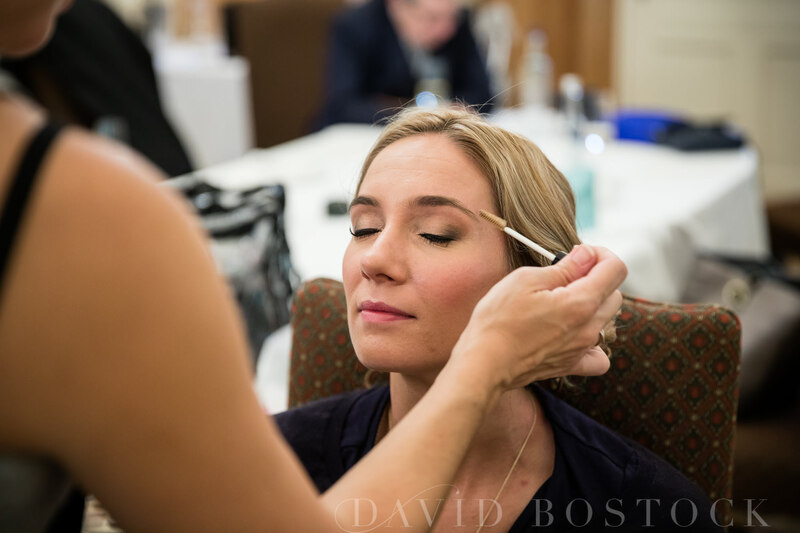 Check out more weddings at The Dairy Waddesdon on my blog, here.